CHICAGO – Despite an obsession for killing a single man to represent a foggy revenge, “Zero Dark Thirty” is an effective thriller in the actual re-creation of that Navy Seal operation. Directed by Kathryn Bigelow (“The Hurt Locker”), the all-star cast is led by a miscast Jessica Chastain. The centerpiece of the film is the killing – on May 2, 2011 – of Osama Bin Laden, the supposed mastermind of all that is evil in the post-9/11 universe. Bigelow breaks down the actual mission, from the first terror-filled days of September 11th, to the actual bullet that was expended from the chamber of USA weaponry to liquidate the terrorist. The first two-thirds of the film is the research, torture techniques and outside-the-box investigations that leads to the ultimate assignment, filmed with a methodical precision that heightened the tension, despite knowing the outcome. Like her previous “The Hurt Locker,” Kathryn Bigelow knows how to structure a military realism that hits home, but in this film she falls short in characterizing the operatives leading up to the mission. It begins with September 11th, 2001, the day America was attacked from terrorist forces, which is determined to be facilitated by Osama Bin Laden, leader of the group known as al-Qaeda. 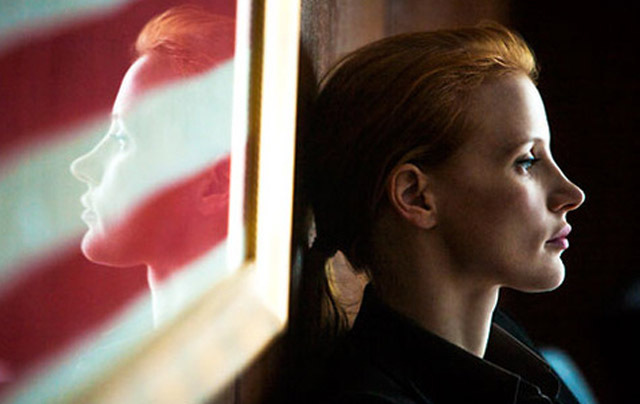 For the next ten years, the build up to the final mission that finally kills Bin Laden is broken down, carried out through one particular CIA operative code named Maya (Jessica Chastain). The first assignment she witnesses is the torturing of an al-Qaeda underling for information. Through the years, as more intelligence operations are implemented to get the “most dangerous man in the world,” more danger starts to surface. Joseph Bradley (Kyle Chandler) – the CIA Islamabad Station Chief – begins to wonder about Maya’s obsession about the mission, and even the head of the CIA (James Gandofini) takes an interest in her quest. It all culminates in the mission in early May of 2011, which successfully avenges the years of investigation.